Hi there. I hope you had a lovely Thanksee, if you celebrated it this past weekend. Mine involved long drives, endless food, and good times with the fam. Here's a toy I completed about a week ago. A while back a very nice gal named Jen Rocha contacted me about doing a knitted version of the mascot for her soon-to-open business, sugi. She says sugi will be "a gallery/store that promotes local artists and specializes in artist collaborations". So here's the mascot, a hilariously cute little octopus. I thought at first that doing a knitted version would be a no-brainer, but oddly enough, this was one of the most difficult toys I've ever made. I just couldn't get that body right - I think I redid it about four times. Octopi are weird, you know? I guess I never thought about it much. They're weirdly shaped. Anyway, here's sugi! Sweet. Tonight I'm finishing up another project for an upcoming group gallery show. Once it's done I'll take pics and post them, can you even stand the suspense? Oh he's sooo cute. Well done Jess. Done a few of them myself lately with great success. How cute! I don't knit well at all but always love to look at what you have done. Really cute! I like the embroidery details. Am looking forward to pictures of new toys. Thank you! 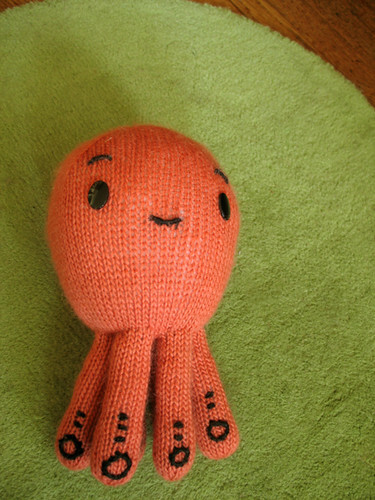 So cute, I got a knitted octopus from the op shop recently, it does look a lot more compicated than the rest of my collection. Always always love your work and looking forward to your pictures.